Lately I have been having difficulty in figuring out the relationship between the title of a book and its contents. This debut novel by Devapriya Roy falls into that category. The brief description at the back sounded interesting, about an unlikely friendship between a newly-married young woman and another one, almost three decades her senior. We are introduced to a hare-brained Sharmila Chatterjee, twenty-two years old, helplessly late for a job interview, having taken a break from her studies to financially help the dire home situation. Her husband, the idealistic Abhimanyu Mishra is pursuing his Ph.D. in an obscure subject, having given up the prospect of a Ph.D. in the USA. Consequently the two have eloped and married in Delhi, much against the wishes of the parents living in Calcutta. When Mil (Sharmila)is hired at the Indian Academy for Literatures, she meets Indira Sen, a senior government officer with whom she hits it off and thereby is supposed to begin a tale. There are some vivid descriptions of New Delhi as the seasons change and some introduction to the mysterious working of the Indian governmental bureaucracy. However, there isn't much of a story to tell in the 300-odd pages of the novel. Indira's life seems to be one where an interesting plot could have evolved, given her strange home situation with a domineering mother, an obsessive-compulsive mother-in-law and a quirky Uncle along with a headstrong teenage daughter. But they seem to carry on with their weirdness, contributing nothing to Indira's life or to the novel. Mil helps Indira with her mounting, incomprehensible credit card debt while Indira seems to do nothing more than share junk food with the younger woman. The characters seem two-dimensional with no significant inner angst other than the obvious daily difficulties of urban life; money problems, maid issues, interfering landlords and in-laws. 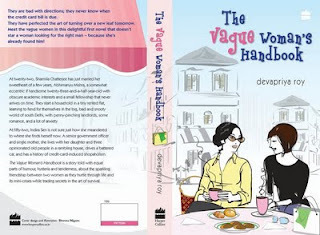 As I mentioned earlier, the title and the story did not match but I can attest that the author seems as vague about what she wanted to convey through her characters and it is perhaps Devapriya Roy's handbook as a vague woman herself.